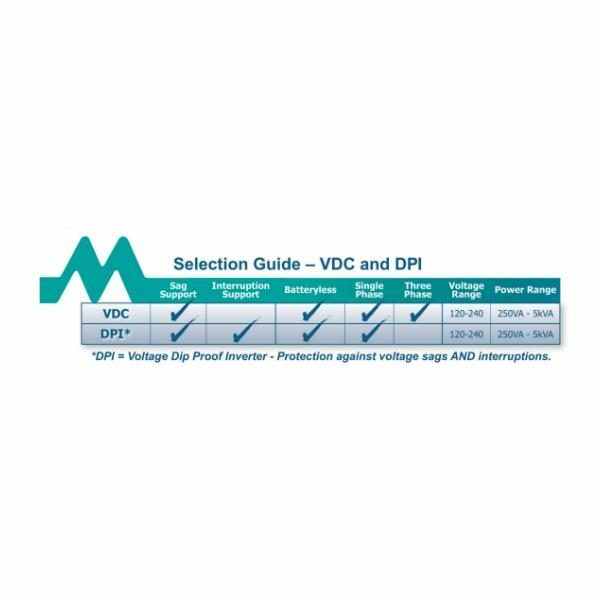 The DPI (Dip Proof Inverter) protects against voltage interruptions (zero volts) AND momentary sags. 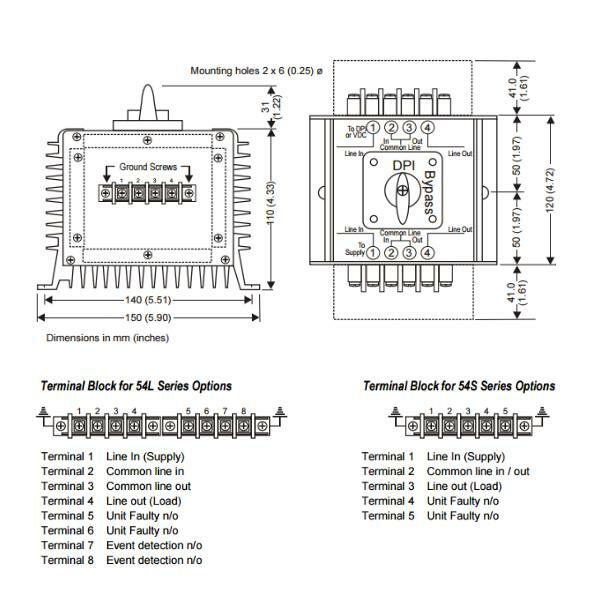 A VDC (Voltage Dip Compensator) only protects against momentary voltage sags. 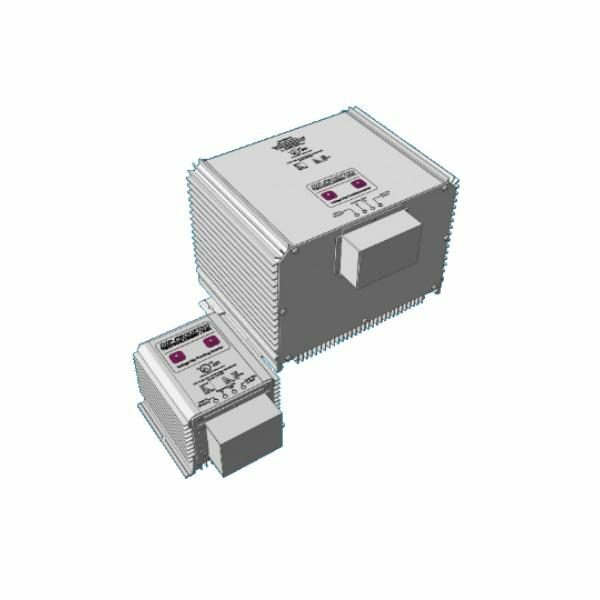 The DPI provides a voltage ride through solution for process controls that suffer from voltage interruptions (including sags) less than 3 seconds in duration. Losses incurred from power quality disturbances far outweigh the cost of installing a DPI. STEP 2: Enter measured values into guide to determine optimal DPI model. 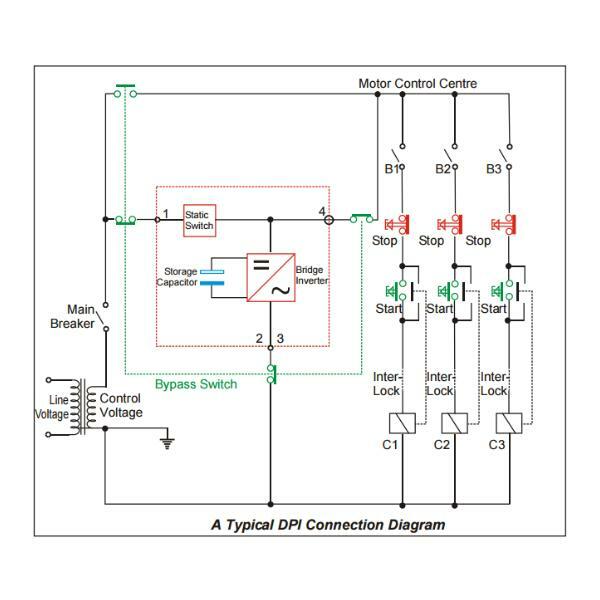 STEP 3: Select preferred DPI model from options below, including voltage and current details. The reliability of electrical power to industry is in general very high, nevertheless voltage sags and short power interruptions or voltage dips occur. These instabilities are caused by short circuits, lightning strikes on overhead power lines and heavy load switching. The duration of such faults is generally shorter than one second. 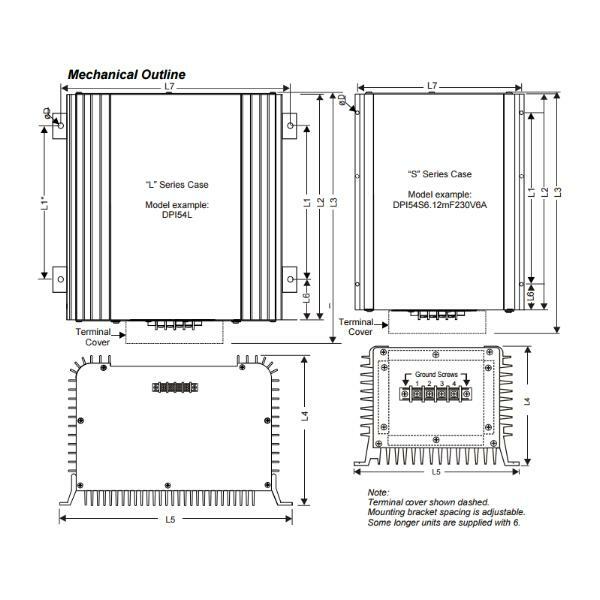 The VOLTAGE DIP- PROOFING INVERTERS (DPI) are designed to maintain the switch gear control voltage during voltage dips, effectively keeping the plant connected. The stored electrical and magnetic energy is allowed to flow, supporting the mechanical inertia of the machinery. When the power is restored after a short voltage dip, the plant is still running at near synchronous speed, the inrush currents will be small and the stress to the system minimal. 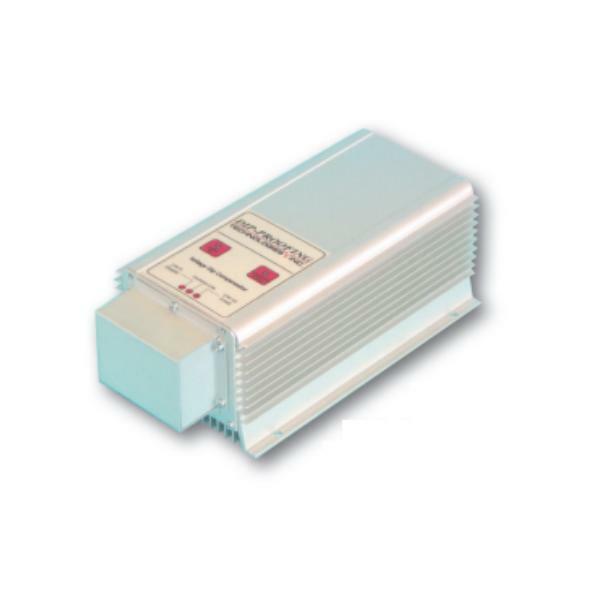 The VOLTAGE-DIP PROOFING INVERTER (DPI) is designed to be maintenance free and highly reliable. It consists of a static switch in series with, and an inverter parallel to, the load. Energy is stored in a capacitor bank. The up-time that a DPI can achieve is dependent on the usable energy in the storage capacitors and on the characteristics of the supported load. Load characteristics are critical in determining the up-time. Resistive loads with a power factor near 1 consume real power and the up-time will be shortest. 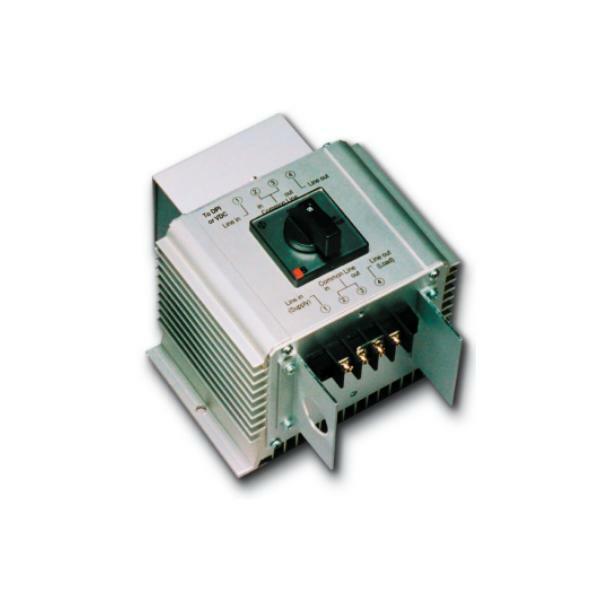 Resistive loads include lamps, switch mode power supplies and linear power supplies. Contactors use little real power as they are a reactive load with power factors around 0.15. Reactive loads such as contactors give the longest up-time. 54S Series – The DPI case is made from extruded aluminium sections. The four parts that make up the case are interlocked and secured by screws. NOTE: there are no user serviceable parts inside the unit. All adjustment points are marked on the top cover plate and can be reached by removing the two screws securing the main label. 54L Series – The DPI case is made from extruded aluminium sections. The six parts that make up the case are interlocked and secured by screws. NOTE: there are no user serviceable parts inside the unit. All adjustment points are marked on the top cover plate and can be reached by removing the two screws securing the main label.